A Grand Bargain For Social Security Reform? MAY 2013 VOICE: As President Obama and Congressional Leaders search for a means to address the current budget deficit and America’s long-term debt, the prospects of a potential “grand bargain” between the White House and Congressional Republicans continues to loom. 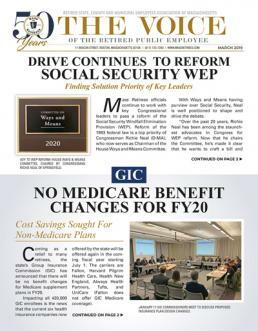 MAY 2013 VOICE: Once again the state’s Group Insurance Commission (GIC) has been able to hold the line on insurance premium rate increases, beating both the state and national averages for an average increase of 3.5% across its offering of health plans. MAY 2013 Voice: A glaring taste of corporate America has arrived in socially conscious Massachusetts in the form of for-profit hospitals that are now doing business in our state. Over the past two years, eleven hospitals in Eastern Mass. have been bought out by Steward Health Care Systems. MAY 2013 VOICE: True to his word, Governor Deval Patrick has filed a bill (H59) to reform retiree healthcare benefits that mirrors the recommendations made by the Special Commission on Retiree Healthcare. See March Voice for Commission details, including retiree/survivor protectons.